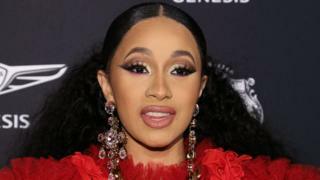 Cardi B don defend herself afta one old video re-show face for internet wey she bin tok say she dey drug and rob men wey wan to sleep wit her wen she bin dey work as stripper before she become popular. "Weda or not my choice dey poor at dat time, I do wetin I need to do to survive." "I neva claim to be perfect or come from a perfect world wit a perfect past, I always speak my truth." Cardi B bin make di original video as her career begin dey take off and na her reply to someone wey tok say she no deserve success because she neva put in any work. "Nothing wey dem hand ova to me. Nothing," she tok inside di video, before she reveal say she go invite men go hotel before she go drug and rob dem. To defend hersef, Cardi B write for Instagram say she don dey tok "about tins for her past right or wrong wey she feel say she need to do to make a living". She add say: "I dey part of hip-hop culture wia you fit tok about wia you come from, tok about di wrong tins you need to do to get to wia you dey." Rappers dey wey dey glorify murder, violence, drugs and robbing. "I no ever glorify di tins wey I bring up for that live [video], I neva even put those tins for my music because I no dey proud of am and feel say na my responsibility not to glorify am. Di rapper say she make di choices wey she do for dat time because she get very limited options. Cardi B end di statement wit di explanation say di men she dey refer to for di old video na men she date or dey involved wit, and dem dey "conscious, willing and aware". But wit all dis explanation some pipo for social media don begin compare Cardi B to Bill Cosby wey court sentence to jail for 2018 afta dem accuse am say e drug and assault women. Odas for social media dey defend Cardi B say she dey open and transparent. Earlier dis year, di rapper make history wen she become di first solo woman to win di Grammy Award for best rap album for her debut Invasion of Privacy.